Jan. 11, 2016 — Scientists at the Children’s Medical Center Research Institute at UT Southwestern (CRI) have teamed with researchers at the Dana-Farber Cancer Institute to pioneer the use of epigenomic profiling and CRISPR-Cas9 gene editing technology in studying how transcription enhancers operate during blood-forming stem cell differentiation and the role enhancers may play in the development of blood cancers. Transcription enhancers are noncoding sequences of DNA that regulate how, when and where protein-coding genes are expressed, which enables cells to grow and develop into the body’s various, specialized functions. The study provides new information about the role of transcription enhancers in normal blood-forming stem cell differentiation, and demonstrates how gene editing technology might enable scientists to target the development of blood cancers by modifying certain noncoding regulatory elements that drive those cancers. 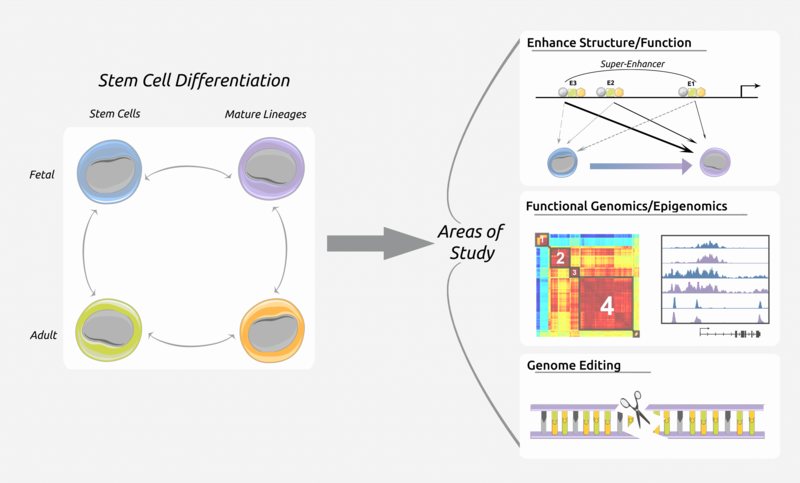 The findings also provide an opportunity for further study to determine if modification of regulatory genomic elements can advance a personalized method of targeting cancers based on individual genetic mutations. The study was published in Developmental Cell.